It’s been a couple of years since we last caught up with MySMS, the platform that syncs your text messages across mobile, Web and desktop. We called MySMS an iMessage for the rest of us, as it means users can write texts from their PC and sync everything across all their platforms. It’s also a useful tool for backing up all your messages, for example if you’re buying a new Android phone and wish to transfer all your old messages over. Today, MySMS is lifting the lid on a new premium model, which is basically shifting most of its useful features behind a subscription. For $9.99 per year (payable in-app), you can back up and restore your text messages, with texts stored in the MySMS cloud. As before, you can also save your messages to third-party cloud services, including Evernote, Dropbox and Google Drive – except this will now be part of your annual subscription. Moreover, you can still receive call notifications on your computer, meaning you can see who’s calling and dismiss it or mute it remotely (though you will of course need your phone if you’re wishing to talk to anyone). Except now, this is a premium feature. Other features now behind a paywall include the ability to Mirror your SMS to another phone, which is actually a very handy tool that lets you access messages stored on another device you may own. There will still be a basic free service that lets you send and receive texts from your computer though. Just the powerful add-on features are now being bundled under a single yearly payment. MySMS remains one of my favorite SMS backup tools, and $9.99 isn’t a lot of money to pay for the features the service provides. Though knowing the online community, having to pay for something that was once available for free may not go down well. MySMS will be adding some extra features to the Premium mix in the coming months too, including SMS scheduling, which sounds intriguing. Premium is only available for MySMS on Android, as the version for iOS is watered down due to, well, Apple. MySMS (and others in the field) can’t ever fully compete with iMessage on iOS, which is why 70 percent of its user-base hail from Android. The Windows Phone incarnation is no longer supported. 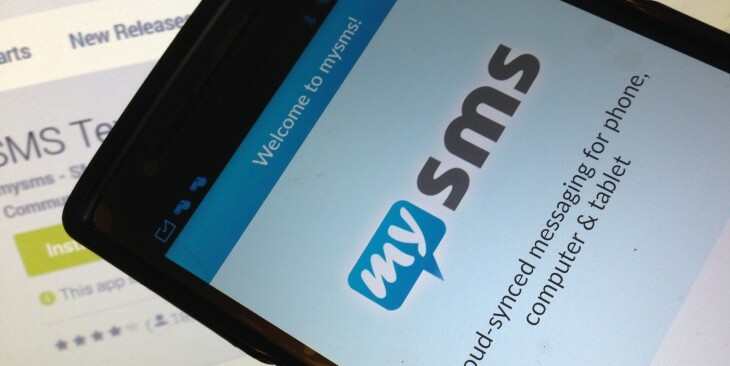 The upgraded MySMS for Android app is available now.